As the 2016 riding season approaches, REV'IT! is scheduled to release a few truly great additions to their riding boot lineup. A few of the more technical boots that REV'IT! plans to unveil are the REV’IT! Scout H2O Boots and the REV’IT! Trail H2O Boots. These particular boots will undoubtedly provide the rider with a technically advanced and stylish opportunity on their next trip or commute. The REV'IT! Scout H2O Boots are intended to provide the rider with a technically reinforced commuter friendly riding boot, that offers CE rated Seesoft ankle protection, a Hydratex liner with a gusseted tongue and a Vibram outsole that helps provide waterproof capabilities with added flexibility and comfort. Along with the waterproof capabilities, this boot offers a reinforced shifter pad, toe box, and and ankle cup to complete the package. This particular boot will have a rather generous American fit and also feature a quick lace system. The next option of which to take not are the REV'IT! Trail H2O Boots. 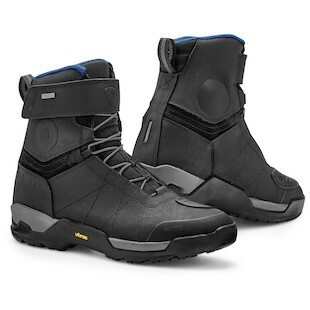 This particular model shares a rather similar design to the Scout H2O Boot, however, there are many upgrades provided such as a full height suede shin protector, an accordion bellow, a full 3D mesh liner, and a Prym Eclair Zipper entrance. Along with a Matte leather finish, this boot does provide the necessary upgrades to make it a slight step up from the Scout H2O boot. With that in mind, it should be an easy decision if you wanted to complete your REV'IT! outfit with some solid functioning riding boots that have all of the necessary technical features. With prices starting at $199 (Scout H2O Boot), there is definitely enough functionality to satisfy every rider.